The Palisade Plunge NEPA public scoping meeting will be held on Thursday, June 15th at the Town of Palisade Community Center (120 W. 8th Street) from 5:30 to 7:30. Edge will be facilitating the meeting for the BLM, USFS, and BOR. The primary purpose of the meeting will be to request comments from the public about issues, potential impacts, and alternatives that need to be addressed in the environmental assessment. The scoping meeting will also helps meet the National Environmental Policy Act intent and requirements for public engagement, and to improve transparency in decision making. 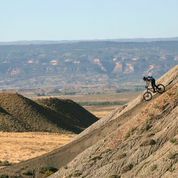 The Palisade Plunge is a mountain bike trail that will drop 6,000 vertical feet from the Grand Mesa to the Palisade valley floor. The trail will connect with the current Palisade Rim Trail and at one point connect to a historical trail used by John Otto. The Palisade Plunge will be a world class project that will attract a more adventurous and skilled rider from all over the world. The entire Grand Valley stands to benefit from the economic boost this can bring. The project has the support of COPMPBA, the Town of Palisade, City of Grand Junction, Mesa County, GJEP and the Palisade Chamber of Commerce. Please come and be a part of the process this Thursday evening. Questions can be directed to the BLM office at 970-244-3027.